Pringles are the original stacked snack. If your family has a taste for something different, keep tradition alive with the timeless taste of Pringles. Available in a whole bunch of delectable flavours like Pizza, Sour Cream and Onion, and, of course, Original, there's a taste for every buddy! 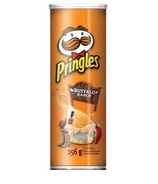 Plus, Pringles come in Multigrain and Reduced Fat and Salt varieties for snackers with special dietary needs. Once you pop, the fun won't stop!